The Service in Science campers explore what they found around the living shoreline at Jockey’s Ridge State Park. 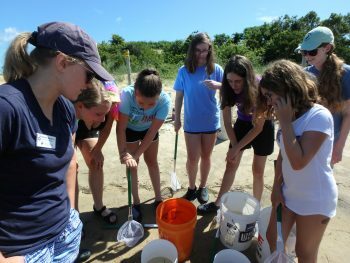 During the week of July 17, six eighth- through 10th-grade students took on the role of coastal scientists during Service in Science Camp, a weeklong camp hosted in partnership by the North Carolina Coastal Federation and Jennette’s Pier. Sara Hallas, coastal education coordinator for the federation’s Wanchese office, as well as Meredith Fish and Hannah Palko, educators at the pier, led portions of the camp throughout the week. Madison Douthitt, AmeriCorps member with the federation, and Kadie Midgett, summer intern with the federation, assisted with activities throughout the week. “I love doing this camp because it teaches the kids important environmental lessons, all while having fun and earning them community service hours at the same time,” Fish said. The week began with a living shoreline exploration at Jockey’s Ridge State Park. This living shoreline was built in 2009 and now serves as a living classroom. The campers identified plants and other distinguishing features, such as the wrack line. They also pulled a seine net through the water to find some of the aquatic inhabitants, including lots of blue crabs, juvenile fish, shrimp and even an American eel. They also worked on oyster restoration at the Jockey’s Ridge shoreline. They helped repair a section of the oyster reef by collecting loose oyster shells that were scattered, re-bagging the shells and placing them back on the reef. During a visit to the Wanchese office, campers learned that stormwater is a big polluter of coastal waters. The Wanchese office shows great examples of LID and stormwater best-management practices (BMPs) in action. They were able to get a closer look at rain gardens, pervious pavement and rain barrels. During a trip to Hatteras Recycle, a local business that does curbside recycling on Hatteras Island, they learned about the recycling process and even got to see the trucks in action. Recycling is especially important in preventing marine debris from harming wildlife. At the end of the week, the campers participated in a series of marine debris cleanups. They traveled by boat to a few dredge spoil islands for the cleanups, which will protect habitats on the island and will prevent that debris from ending up in the water. Overall, the week offered the chance for students to become better environmental stewards all while earning community service hours. “This camp was fun and hands-on, but the biggest thing they will take away from it is the responsibility they have in protecting their local environment,” Hallas said.